A small breakthough in the pool last week with a mini set of 4 x 100m on a time not too far off my best of a few years ago - woo hoo! I won't say what the times were because I'm embarrassed but it was certainly a step up from where I've been in the last year. Last week was a Kohi swim which was the super fun 4 lap course but wasn't quite so super fun with lots of people swimming over and into me and lots of salt water going down my throat. You people who can swim fast have not idea what it is like to swim where I do and get beaten up all the time. Not as much riding in the last two weeks due to Kezzle finishing his Ironman training and no longer needing his hand held, plus I was in QUeenstown over the weekend so missed my Sunday ride. I haven't even downloaded any bike info from last week yet, oops! BUt the most exciting news is the RooRoo's hanger FINALLY arrived so I got to go aero again in the weekend. We were in the middle of the 'weather bomb' which disrupted IMNZ but it wasn't too bad in Auckand so RooRoo and I headed out to the waterfront for some fairly average efforts in some fairly average weather but it was good to be back on my TT bike in time for some Auckland Half training. Went for a delicious long run in Queenstown in the weekend all the way from town to Kelvin Heights on the Frankton path while all my friends were hungover and sleeping the morning after a wedding, they don't know what they're missing! Made an appearance back at the O'Hagan's 5km which was less then impressive but more impressive than it has been and also good enough to win the girls division (!) while J-Rad ran a PB and his first overall win. 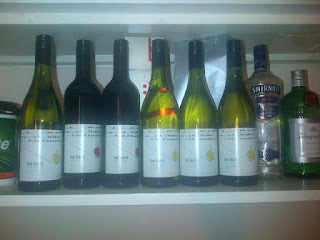 So we are now stocked up on wine for a while - pity neither of us drink it at home.